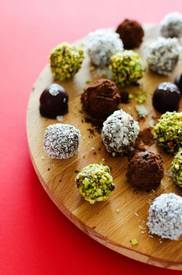 Ok so hear me out…Chocolate Mashed Potato Truffles. So naturally potatoes are creamy and chameleon-like in their way of taking on flavors. And so I give to you these chocolatey on the inside, yummy whatever-you-want on the outside mashed potato truffles!